Now this is one blue man. We don't think he's too upset about it though but to be fair we're just guessing because we can't actually see his face. We're going to guess that he's a superhero though and an incredibly intelligent one at that. Why, you ask? Well because while most superheroes decide to protect their identity by wearing a mask that barely covers their eyes, this guy has the brains to barely even show the shape of his face! He could have a giant mustache and we would have no idea! Need to hide your identity and look awesome while doing it? 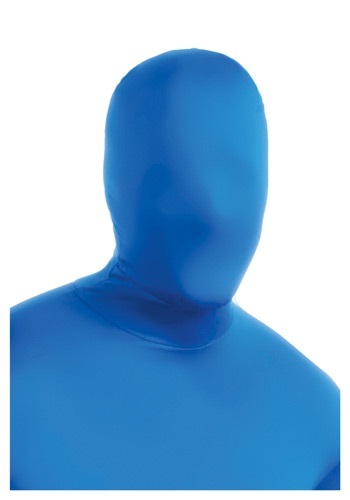 Just grab your morphsuit and throw this sweet mask over your head. Lots of heroes and villains out there will probably try to convince you that the monochromatic look isn't the way to go but what do they know? Most of them hardly seem to care about protecting their secret identities anyway.